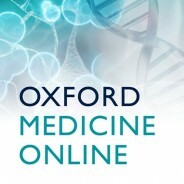 Oxford Medicine Online is home to Oxford University Press' prestigious medical publishing, bringing together authoritative texts by world-renowned authors. These highly-regarded titles include the Oxford Textbook of Medicine, the Oxford Handbook of Clinical Medicine and works from the Mayo Clinic Scientific Press. To mark World Anaesthesia Day (Friday, 16 October), we have selected ten of the most interesting events in the history of anaesthesia. From the discovery of diethyl ether by Paracelsus in 1525, to James Young Simpson’s first use of chloroform in 1847, and the creation of the Royal College of Anaesthetists (responsible for the British Journal of Anaesthesia) in 1992 – anaesthesia is a medical discipline with a fascinating past. Attempts at producing a state of general anaesthesia can be traced throughout recorded history in the writings of nearly every civilisation. Despite this, advancement in this area was still relatively slow. The Renaissance saw significant advances in anatomy and surgical technique, but such procedures remained a last resort. It was scientific discoveries in the mid-19th century that were really critical to the adoption of modern anaesthetic techniques. Just as it has progressed in the past, anaesthesia is continuing to evolve in the present day. Modern developments such as tracheal intubation, advanced monitoring and new anaesthetic drugs, have all helped the specialty develop. Take a look at our interactive timeline at the bottom of this article for even more fascinating facts, free chapters, and commentary on the history of anaesthesia. According to Chinese tradition, during The Three Kingdoms period (225–265), the eminent physician Hua Tuo (140–208) developed an analgesic potion called mafeisan (a mixture of herbal extracts). One of his patients, General Kuan Yu, was wounded by a poisoned arrow. 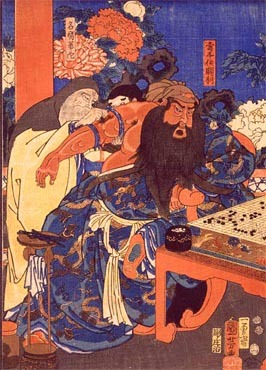 Image Credit: ‘Japanese Woodblock: Hua Tuo operating on Guan Yu’ by Utagawa Kuniyoshi (1798–1861), Public Domain via Wikimedia Commons. As the story goes, General Kuan Yu drank the potion and played chess as his bone was scraped clean by Hua Tuo while his attendants fainted. Medical scholars believe that this is the first documented use of anesthesia during surgery. According to records, General Kuan Yu maintained his poise, without betraying the slightest sign of pain. In 1525, Aureolus Theophrastus Bombastus von Hohenheim (1493–1541), better known as Paracelsus, discovered the analgesic properties of diethyl ether. The history of general anaesthesia is rich and storied – even the very concept of anaesthesia has roots in the parallel evolution of religious beliefs and medical science. Paracelsus pioneered the use of chemicals and minerals in medicine. His hermetical views were that sickness and health in the body relied on the harmony of man (microcosm) and nature (macrocosm). While ether was known to Paracelsus in the sixteenth century as sweet oil of vitriol, it took another three centuries for its use as an anaesthetic to be fully realized. On 11 December 1844, Horace Wells, a dentist from Hartford, Connecticut, witnessed a public display of a man inhaling nitrous oxide. The man subsequently hit his shin on a bench – but as the gas wore off, he miraculously felt no pain. With inspiration from this demonstration and a strong belief in the analgesic (and possibly the amnestic) qualities of nitrous oxide, on 12 December, Wells proceeded to inhale a bag of the nitrous oxide. Interestingly, inhalation of nitrous oxide for recreational use began as early as 1799 amongst the British upper class, at ‘laughing gas parties’. Today, it is still used for similar purposes – commonly referred to as ‘nos’. Image Credit: William Thomas Green Morton (1819–1868), Unknown author, Public Domain via Wikimedia Commons. Modern anaesthesia as we know it began in earnest on 16 October 1846, with a young Boston dentist named William Morton. He gave the first successful public demonstration of painless surgery using ether; removing a tumour from a young man’s neck in Boston, Massachusetts. Morton had previously worked alongside Horace Wells, and knew of his experiments with nitrous oxide. Given Wells’s embarrassment when one of his demonstrations went wrong however (removing a man’s tooth using nitrous oxide), Morton sought something more effective. He experimented, with the help of the chemist Dr. Charles T. Jackson, with sulphuric ether, trying it first on his spaniel and then a young man, Eben Frost, again for tooth extraction. It was a great success, and the ether rendered the subjects insensible to the pain inflicted. Morton, and the field of anaesthesia, were on the road to fame. 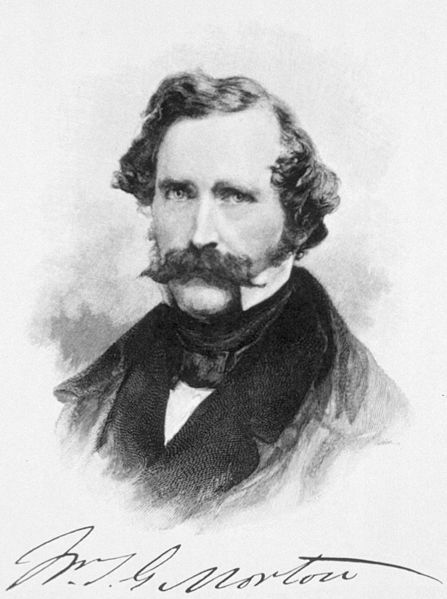 Scottish obstetrician James Young Simpson, 1st Baronet (1811–1870) of Edinburgh, was the first to introduce chloroform for general medical use. Previously, he had used ether in childbirth – but because of the unpleasantness of this drug, he began experimenting with other chemicals. On 4th November 1847, Simpson and two of his friends (Drs. Keith and Duncan) inhaled chloroform – experienced a light, cheery mood – and promptly collapsed. On waking, Simpson knew he had found a successful anaesthetic. After this point, the use of chloroform anaesthesia expanded rapidly. Chloroform was much easier to use but was later shown to be much more dangerous in overdose than ether. In the early days of its discovery, it was used widely and indiscriminately, and inevitably soon became incriminated in a number of anaesthetic deaths. This discovery signalled the dawn of local anaesthesia. Cocaine had been identified and named by Friedrich Gaedcke (1828–1890) and then Albert Niemann (1834–1861) in 1855, and was used topically by a number of physicians. It was the use on the eye however, by Karl Koller in 1884, that first stimulated widespread interest. Koller’s findings were a medical breakthrough. Prior to his discovery, performing eye surgery was difficult because the involuntary reflex motions of the eye to respond to the slightest stimuli. It is perhaps a further comment on the quality and safety of general anaesthesia at the time, that new methods of achieving painless surgery were so vigorously sought. Image Credit: ‘Moleküel – gebaut mit dem Molekülbaukasten; Cyclopropane’, by Bin im Garten, CC by SA 3.0, via Wikimedia Commons. Alongside his colleague at the University of Wisconsin-Madison (Dr. Ralph M. Waters), Rovenstine first developed the anaesthetic use of the gas cyclopropane. 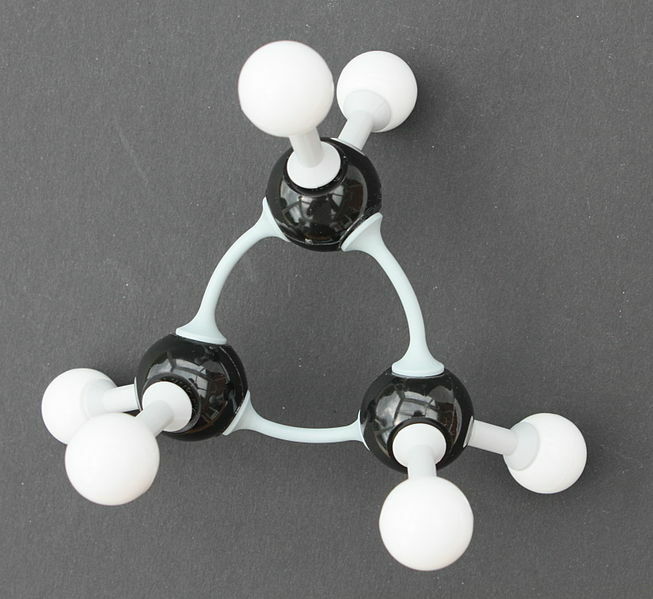 When cyclopropane was first introduced in 1929, it was used for thoracic anaesthesia. In 1930 however, Rovenstine reported the use of cyclopropane for thoracic work – with tracheal intubation but spontaneous respiration. Carbon dioxide absorption with the Waters canister (originally named the ‘Waters To-and-Fro Carbon Dioxide Absorption Canister’, invented by Ralph M. Waters), made use of cyclopropane more economical – and its use took off. By 1939, cyclopropane was the anaesthetic of choice for thoracic anaesthesiologists. Despite its popularity however, cyclopropane was also highly explosive; and ignition could have had serious and even fatal outcomes. On 13 October 1947, Dr. JM Graham performed spinal anaesthesia on Albert Woolley and Cecil Roe. As a result of the surgery, both suffered permanent spastic paraparesis that blighted the remainder of their lives. The ensuing case did not get to court until 1953. The main witness for the Graham’s defence was Professor Robert Macintosh, author of a leading textbook on spinal anaesthesia and the inaugural Nuffield Professor of Anaesthetics at Oxford University. Whatever the cause of Woolley and Roe’s paraparesis, the effects upon regional anaesthesia in general and spinal anaesthesia in particular were negative, dramatic, and long lasting. They greatly added to concerns about the safety of spinal anaesthesia raised by a 1950 article entitled: “The grave spinal cord paralyses caused by spinal anaesthesia”; and fueled a fear of regional anaesthesia in general. These reports cast a grey pall over spinal anaesthesia, and may well have delayed its introduction into obstetric anaesthesia. 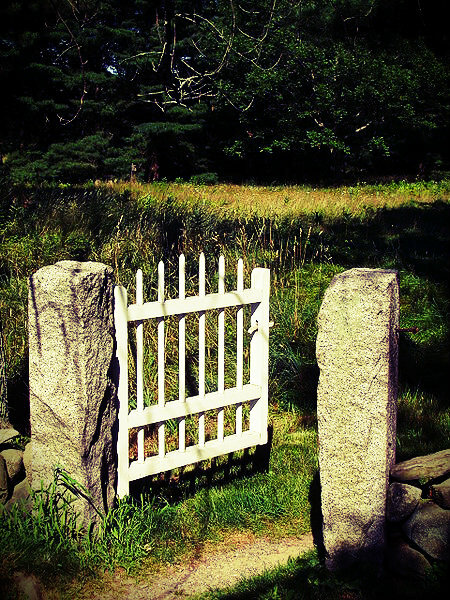 Image Credit: ‘Garden Gate’, by Eptalon, CC by SA 3.0, via Wikimedia Commons. In 1965, Ronald Melzack and Patrick David Wall introduced an imaginative and comprehensive theory, known as the gate control theory of pain, to account for horrific injuries that are sometimes not felt as pain, and minor injuries that are sometimes felt as severe pain. They used recently discovered physiological data and clinical data to suggest that a mechanism in the spinal cord “gated” sensations of pain from pain receptors – before they were interpreted or reacted to as pain. Combining early concepts derived from the specificity theory and the peripheral pattern theory, the gate control theory is considered to be one of the most influential theories of pain because it provided a neural basis which reconciled the specificity and pattern theories and ultimately revolutionized pain research. The first National Anaesthesia Day was held in Great Britain on 25 May 2000 – organised by the Royal College of Anaesthetists. On a global scale, the World Anaesthesia Day takes place every year, on 16th October. Originally named ‘Ether Day’ it is held in order to commemorate William Morton’s first successful demonstration of ether anaesthesia at the Massachusetts General Hospital on 16 October 1846. As well as World Anaesthesia Day, the first specialist anaesthetic college was created by Royal Charter, on 16 March 1992. This was a defining moment in the creation of an independent body, responsible for “Educating, Training and Setting of Standards in Anaesthesia in Britain.” Today, the British Journal of Anaesthesia (BJA) is published under its auspice; as the oldest and largest independent journal of anaesthesia. Featured Image Credit: ‘Anaesthesia: Nitrous Oxide Cyliner, 1939’, from Wellcome Images (Wellcome Trust). CC BY 4.0, via Wikimedia Commons. Amelia Carruthers is a Marketing Assistant with Medicine Books, at Oxford University Press.